Please sign and share this petition worldwide in an effort to shut down this dog grooming shop that was noted with cruel and inhumane practices in its past. Past or present, hanging a dog is not acceptable treatment of an animal you are supposed to love and give it a beautiful, comforting new look. 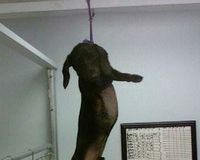 The Olga Dog Spa in Wilmington, NC, also known as the Wilmington pet grooming business has failed many state inspections, especially after a dog was found photographed and hanging in the facility. Ever since that incident, the shop no longer grooms animals but still boards them. Olga explains that the dog in the photo was wearing a harness and unharmed! And it was a thing of the past! So?? Her point is?? ?